No, this is not the 1930s, but wood garage doors are all the rage once again. Wood garage doors are a favorite buy for new homeowners and home renovators. Why in the world is that? Well, wood garage doors often have that old rustic look that meshes well with most types of homes. Wood garage doors are also very durable when it comes to mother nature’s more violent weather. They can also take more hits from vehicles and other objects without being severely damaged. There are many reasons that wood garage doors are at a new peak in popularity. So what do you need to know before you buy a wood garage door? Everything about them, of course! There Are Multiple Wood Garage Door Styles! Do you like the standard overhead garage doors or old-school barn style garage doors? That is the question posed here. Once you choose a wood garage door installation and it is installed, it is only going to open one way. However, you get to choose which way that is. There are many different styles of wood garage doors to be had, and most of them look great. All of them at least look good. So, Mahogany or Oak? 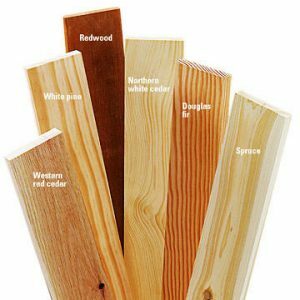 There are many different types of wood grain for you to choose from as well. The best way to determine this is to look at examples of wood garage doors already installed. Pictures work, but you will likely be driving around and see a few. 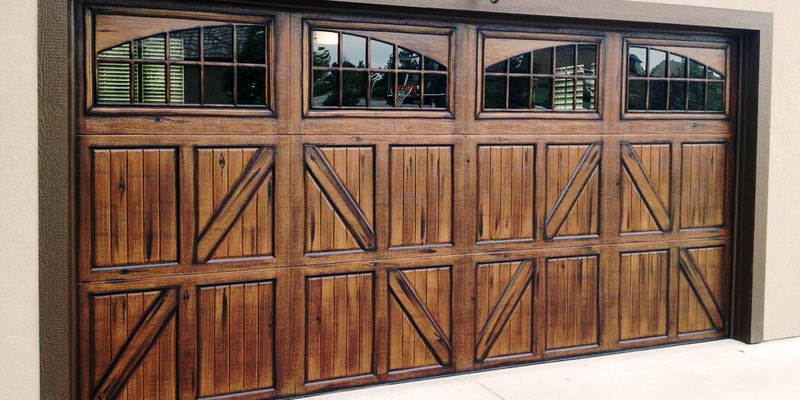 Wood grain garage doors are truly a marvel to behold, but they go beyond looks in the advantages department. The first of which is how unique they are. A real wood garage door will always have a distinct pattern of its own regardless of natural color or paint. These bad boys are durable. A light tap from a car or any other sizeable moving object is unlikely to dent a garage door made of wood. They are much more durable overall than a steel or aluminum garage door. They are not even comparable to a vinyl garage door in this sense. Vinyl garage doors are beautiful but break so easy in comparison to a wood garage door. Did we mention that they are very customizable? Engraving on them is even a possibility if that’s what you are like. So what is not so great about wood garage doors? Well for starters, they are not terrible weather resistant on their own. 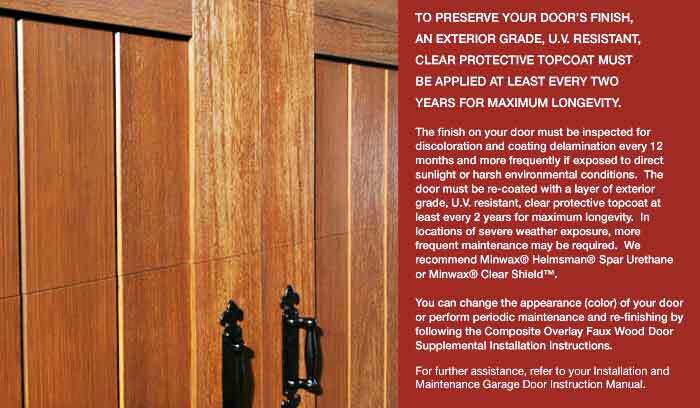 Wood garage doors need a bit more maintenance than most other garage door materials do. This is unfortunate but doable. You’re going to have to clean them and repaint them probably once or even twice a year. The second part is only correct if you have painted them, which is recommended to further weatherproof them. At least use some wood water sealer on them. Finally, the cost is an issue with wood garage doors. They cost more to buy, have installed and maintained. An Alternative To Standard Wood Garage Doors: Faux Wood Garage Doors! These garage doors look just like wood but are made either of steel or fiberglass. They are cheaper maintenance wise and usually a more affordable choice of garage door installation. They can also be engraved on after the wood finish is painted on. There are plenty of options for wood grain finishes that are only limited if you choose an insulated faux wood garage door. They are a little bit more of a dent risk, but not by much. Faux wood garage doors are your best bet for a unique alternative to standard wood garage doors. Want to get started with your new garage door installation today? Clark’s Garage Door & Gate Repair in Los Angeles is the best garage door repair and installation company in the area. Just Call (877) 622-8183 for the best wood garage door installation service experience. Just need garage door repair? 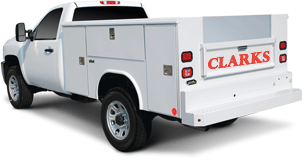 Clark’s Garage Door & Gate Repair will happily take care of that for an affordable price. Our garage door service techs are all experts on every garage door aspect, even garage door accessories! Don’t wait another day to get your garage door back on track.